Older Americans reaching for some bud are on the rise, according to a new study. And who can blame them? The earth is literally dying all around us. The National Survey on Drug and Alcohol Use found that, analyzing data from 2015 and 2016, 9 percent of 50- to 64-year-olds said they had totally blazed, brah in the last year—up from 7 percent in the previous survey, published in 2013. Likewise, 3 percent of 65-year-olds and older folks had toked it up, when only 1.4 percent had previously. Are you surprised? Don’t be. 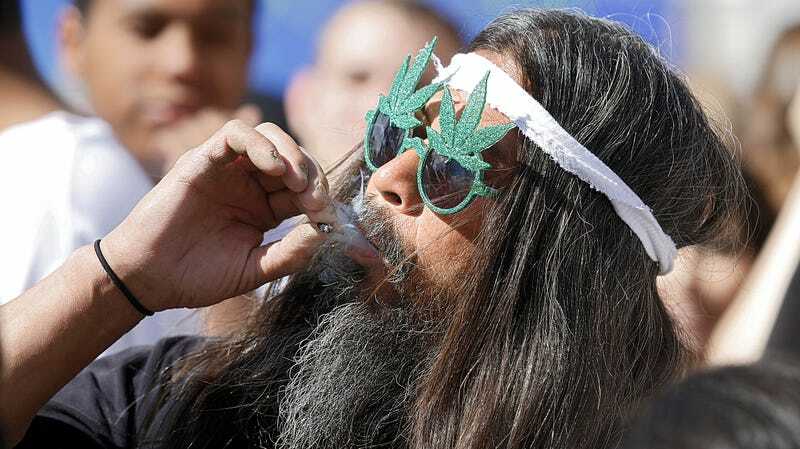 Smoking the ganj is increasingly legal these days, so why not? A quarter of the 65-and-older adults who said they’d hit the reefer in the last year said they got approval from the doctor. Mazel tov! Also, these oldies were literally born during or right after the summer of love, or they were teenagers during it, and you can bet they saw plenty of hash being puff, puff, passed around then. Listen, in the words of the ever-wise Maya Rudolph, I say: smoke ‘em if you got ‘em. Anything less would be wasteful. Would Kathy Bates&apos;s New Weed Show Disjointed Be Better If I Were High?